Rarely are rally-starts as bizarre as this. We all gather in large parade ground in the centre of town, larger than Trafalgar Square, for a grand send off. After months of planning by the town council, what could possibly go wrong? The brass band lined up and just as cymbals clashed, big base drum banged, clarinets, flutes and trombones adding to the general oompah, the rare Anadol – a fibreglass car once made in Turkey with the help of Reliant, powered by a Ford Cortina engine, made its way down the main street of Ulaan Bataar. It was heading to the main square to be flagged away by the Mayor, crowds lined the roads, with several hundred spectators taking time out from their journey to work to watch the spectacle. Then there was an added crash. The Anadol ran across a grill in the middle of the street, which promptly cracked underneath the car, and the rear wheels dropped down into the hole. Had this happened to a Bentley, or a Veteran, the big wheels would have laughed it off. But a 13 inch Minilite wheel falling into a 18-inch hole is an easy fit. The car’s rear axle now rested on the tarmac. Above the sound of the brass band, the sirens of the fire-brigade hurrying through the streets to rescue a startled Amet Ongun, now worried that he might be collecting penalties points for being late for the Start. Once out of town, we climbed steadily, and the morning sun burnt a large hole in the grey sky. We were heading for a long, dusty Time Trial, over 40 kilometres of bumpy strips of sand with tall grass growing up the middle, crossing a vast plain. The only company once off the main road was a herd of some 100 wild horses, who oblivious to the noise of approaching rallycars, made mobile chicanes by taking it in turns to gallop across the track, with eagles circling overhead. Drivers needed all their wits about them for this one. Several cars beached themselves struggling to traverse the high central mound, with an option of a different tracks suddenly emerging, testing times indeed for the navigator crouched over the Tulip route-book, Garmin GPS, and trip-meter. Best time among the Classics Category was the Holden of Gerald Crown, the 72-year-old Ozzie Veteran with young Matt Bryson on the clocks put up a steady, consistent run to set a 25m29s time. 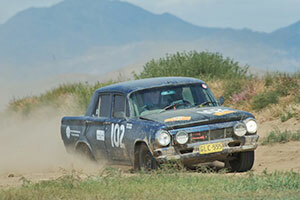 Making up for its dramatic start back in town, second best was the Turkish Team in the now flying Anadol, with 26:16, pipping the Staples Junior VW Beetle Cabriolet on 26:33. Best in the Vintageants was the Thompson/Davies Chrysler 75 Roadster from New Zealand, who set a fourth-best time of 26:34, with the Clive Dunster Chevy Fangio Coupe 12 seconds behind. Generally smooth, with just the odd washaway to catch out the unwary, with long patches of soft sand, it had sufficient corners to suit the agile Alfa Romeo of Alastair Caldwell and Catriona Rings, who were 6th, with a time of 26:53. 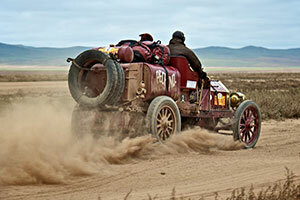 Among the pioneers, the 14-litre La France was well up the leaderboard on 37:22, and David Ayre’s Itala was on 37:38, a time good enough to beat a Volvo PV544. Tonight, we are all in Yurts, the white round portable cabins made of thick layers of horsehair and cashmere carpeting which is wrapped around a basket-weave construction, we all have little log-stoves in the centre and a chimney with a generous hole in the roof. As darkness falls across this vast open plain at Bayanuur, a chilly air is rolling down the hillsides that flank this remarkable valley, and most of us are digging out of sleeping bags for extra covering on the camp beds. We have dined out on bowls of chicken stew, lamb stew, rice, chips, bean salad, and a choice of two soups for starters. A lack of tables and chairs meant a crowded dining hall, with several crews sitting on the floor… the atmosphere is remarkably good humoured and rare does any rally experience such a united sense of camaraderie as this. Batten down the hatches, and chuck more yak-dung on the stove. Winter arrives early in Mongolia, and we look like being in for our first freezing night.